Epact: Horizontal Dial unsigned, late 16th century ? 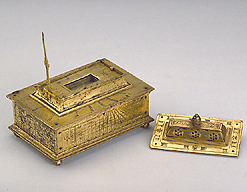 This brass dial is in the shape of a casket, with two supplementary compartments on the top. One of them contains the compass and the string gnomon dial, the other, with small flower-like perforations, can be opened from the inside but its function is not clear. The dial has tables for converting time in different systems of hours and for calculation, and a calendar scale on the inside of the lid. The box contained other parts which are now lost. © British Museum, London. All rights reserved. Information and images provided here may not be reproduced in any form or by any means without the prior written permission of the museum.